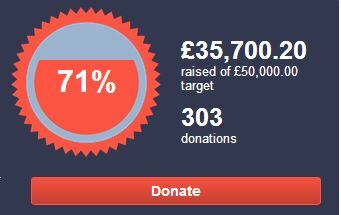 We are getting there, slowly edging towards our target and every penny really is helping. For those that were so generous last year, please do consider helping again this year. Those who gave from February’s pay packet – could you do the same again this month? If you have the opportunity to run an event, Andy raised over £200 with Gift aid from a bake off at work. Its hard work fund raising and asking you all for a few or a lot of pennies. But we really do need your help.